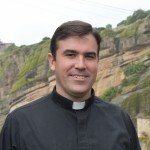 Fr Devin Roza, LC is visiting professor of New Testament at the Pontifical Athenaeum Regina Apostolorum in Rome. He has a licentiate degree in Sacred Scripture from the Pontifical Biblical Institute and a licentiate in philosophy from the Pontifical Athenaeum Regina Apostolorum. He was born in 1977 and was ordained a priest in 2011.